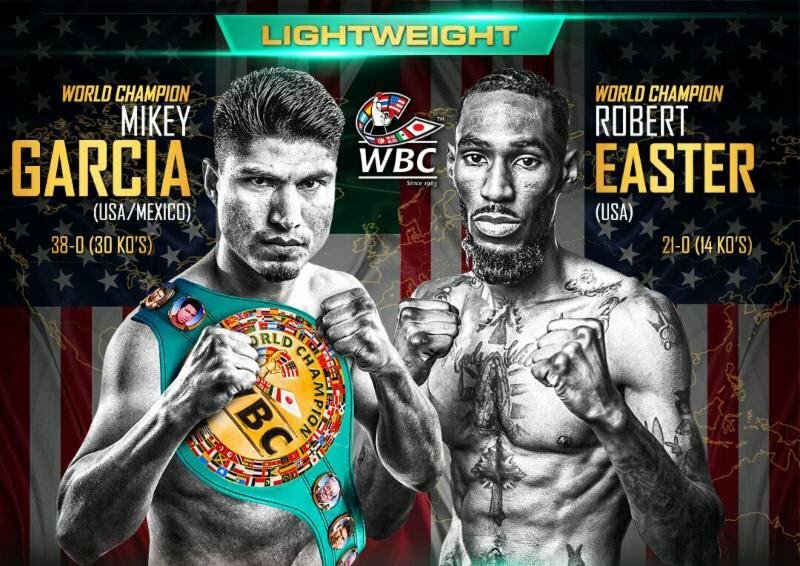 WBC stats: Mikey Garcia vs. Robert Easter Jr.
Days ahead of his 135-pound title unification showdown with Mikey Garcia (38-0, 30 KOs), IBF Lightweight World Champion Robert Easter Jr. (21-0, 14 KOs) reflects on the path that has led to the most important night of his career in a video feature released today by SHOWTIME Sports®. Born and raised in Toledo, Ohio, Easter dreamt of one day accomplishing what his father, also a professional boxer, was never able to accomplish: becoming a world champion. Easter, who has made three successful defenses since winning his world title in an exciting contest over Richard Commey in 2016, decided to make the move to conduct training camp with Kevin Cunningham in West Palm Beach ahead of Saturday night’s unification against the WBC Lightweight Champion Garcia. Cunningham has worked with former world champions Devon Alexander, Cory Spinks and Adrien Broner and recently spurred Gervonta Davis to a dominant knockout of Jesus Cuellar. Live coverage of the SHOWTIME CHAMPIONSHIP BOXING telecast begins at 10 p.m. ET/7 p.m. PT and also features Cuban heavyweight slugger Luis Ortiz (28-1, 24 KOs) returning to action to face former world title challenger Razvan Cojanu (16-3, 9 KOs) and opens with unbeaten super lightweight contender Mario Barrios (21-0, 13 KOs) taking on hard-hitting Jose Roman (24-2-1, 16 KOs) in a 10-round showdown. Manager: Al Haymon / Trainer: Robert Easter Sr.
Carlos Ortiz (Puerto Rico), Ismael Laguna (Panama), Mando Ramos (US), Jose Luis Ramirez (Mexico), Stevie Johnston (US), Jose Luis Castillo (Mexico), Antonio DeMarco (Mexico). 150 lightweight world title bouts have been held in WBC history. 79 lightweight world title bouts have been held in the United States in WBC history. You are here: Home / Press Room / WBC stats: Mikey Garcia vs. Robert Easter Jr.